Molnlycke Tubigrip (10M, Size A, part number 1435) is a multi-purpose tubular bandage designed to help treat sprains, strains, ribcage injuries, or other soft tissue injuries. No pins or tape required. Pack of 3 bandages. 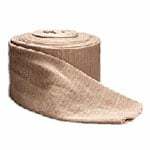 Molnlycke Tubigrip (10M, Size A, part number 1435) is a multi-purpose tubular bandage designed to help treat sprains, strains, ribcage injuries, or other soft tissue injuries. No pins or tape required. Sold as a pack of 3 bandages.